Right in my hood, easy access, yes! I live in Bay Ridge, Brooklyn. While we have many local restaurants here that are great staples in the neighborhood, there are not many spectacular destination dining that will lure people away from the city into Brooklyn. The one exception it seems is Tanoreen. And I’m quite disappointed in myself for only having tried it for the first time last week even though it’s been in the neighborhood for about as long as my family have since we moved here eons ago. Their first location has been around since 1998, their new bigger location at 3rd ave has been there since 2009. I definitely plan to make up for lost time and come here more often; there are still so many dishes to try. 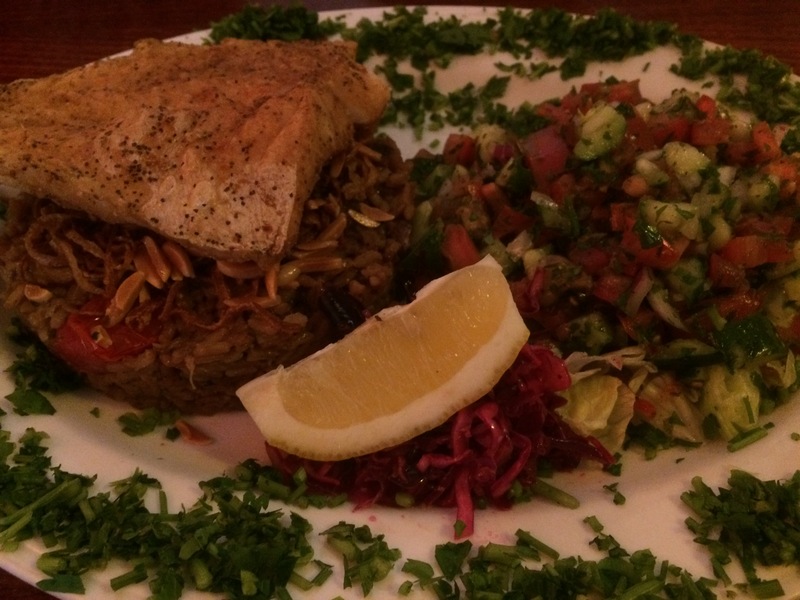 Tanoreen serves a wide array of Middle Eastern dishes. 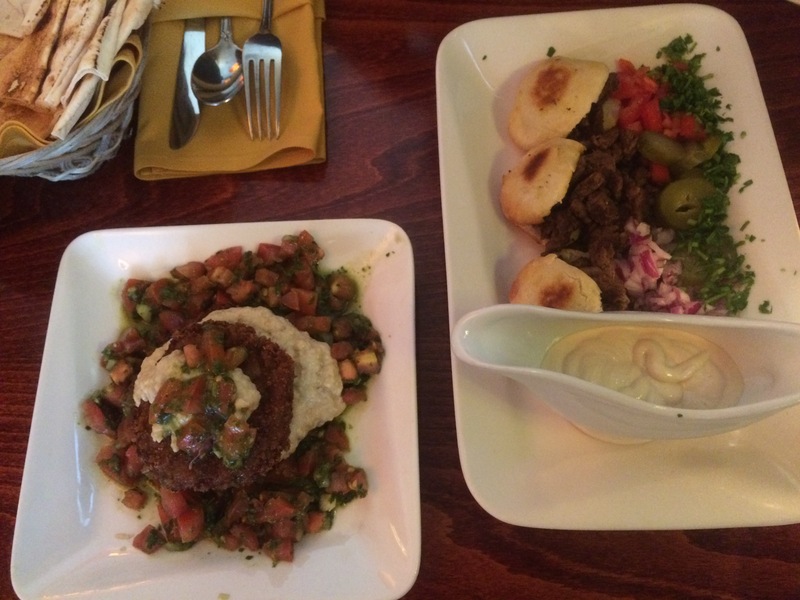 It’s Middle Eastern fare with Mediterranean accents. 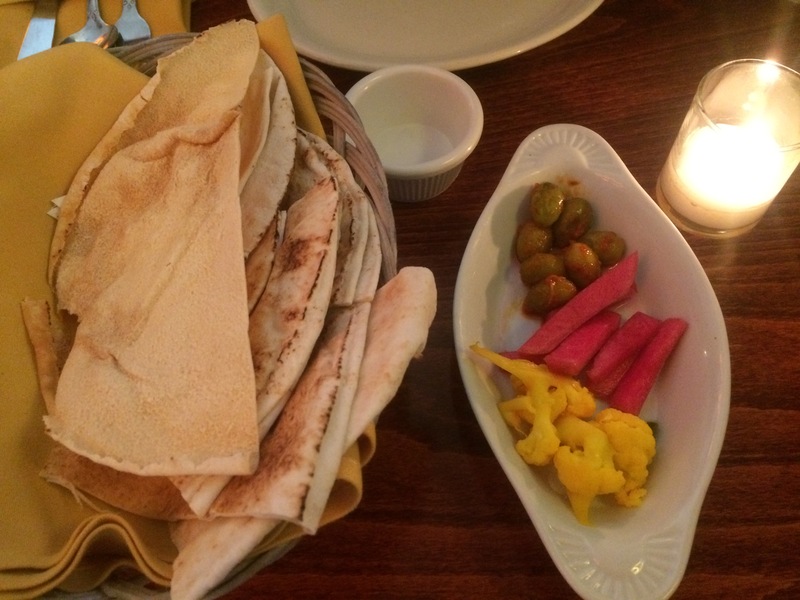 After you order, they serve some thin pita and flatbreads along with picked veggies. The pickled veggies were intensely flavored, actually a bit too strong for me. But that is just a preference as my friend A enjoyed the beets and cauliflower. 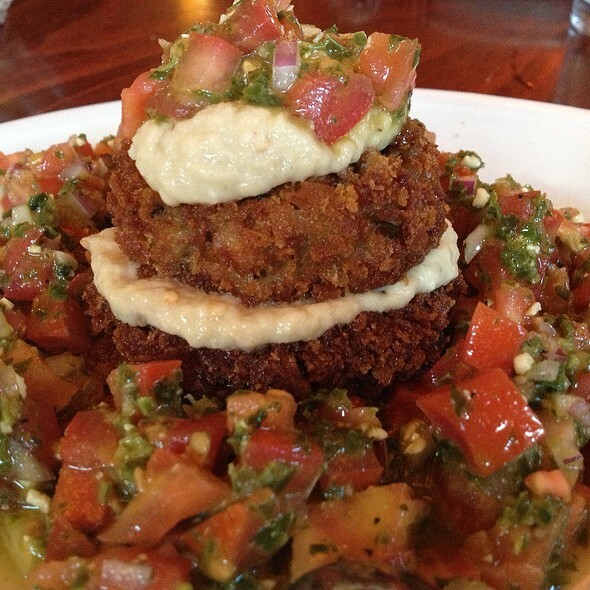 We started with the Schwarma Sliders and Eggplant Napoleon. The Schwarma Sliders ($12) were three mini pita stuffed with marinated lamb, parsley & tahini with tomatoes, pickles, red onions, and tahini sauce on the side. We enjoyed the sliders a lot. It was a bit of a mess trying to get everything in each bite as the pitas were overflowing with meat. The tahini sauce was a great foil to balance the spices of the meat. This was a great starter to the rest of the meal. While the sliders were good, my favorite dish at this dinner was the Eggplant Napoleon. I had read great reviews for this dish so it was on my must-get list. It sure did not disappoint! The dish was great in that every component came together really well. It was basically eggplants two ways. There are two eggplant slices that was nicely fried; crispy on the outside and soft on the inside. It’s layered with baba ghanoush, which is cooked eggplant pureed with tahini, garlic, and lemon. All of this is surrounded by a tomato & basil salata. I love biting through that crispy exterior into the soft creamy interior, mixed with the baba ghanoush and some of the tomato, it’s a perfect bite. You can use the pitas from the beginning of the meal to finish up the leftover baba ghanoush. On to our entrees. They were huge portions! I could only get through half of mine and A barely made a dent in hers. 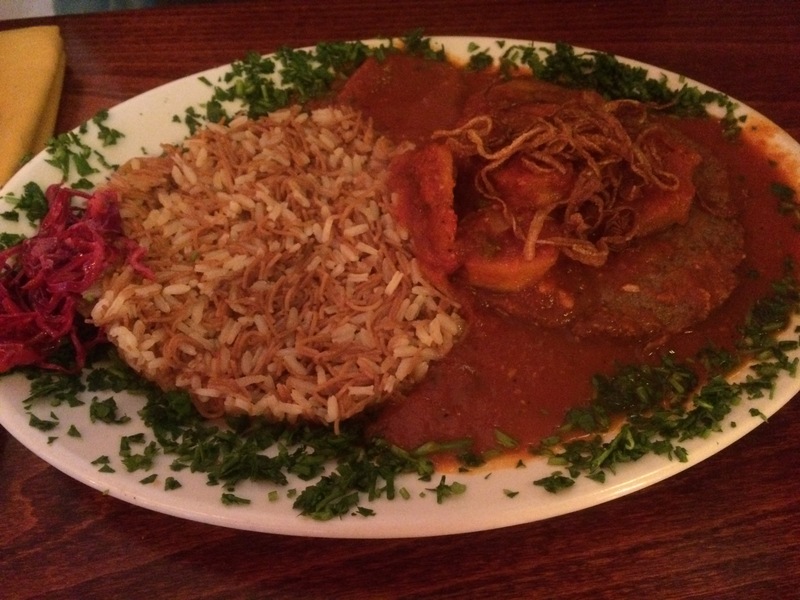 I had the Kafta ($21), which is baked spiced ground lamb with onions and parsley in a tomato (or tahini) sauce. There were also potatoes. The dish comes with a huge portion of rice on the side. The rice was mixed with an unknown item I will inquire about next time, I thought it might’ve been garlic but usually it would be crispy and this wasn’t so I’m not sure what it is. Whatever it was, I enjoyed it and kept going back to the rice. The kafta was good, the meat was well cooked, but it was a huge slab and I got tired of it pretty quickly. But it did make a good leftover lunch for the next day. Huge dish of filet of sole, sauteed rice, and salad. Worthy of a fisherman’s meal indeed! A had the Sayadiyya ($24) [yea.. we couldn’t pronounce it either lol]. Sayadiyya, or “the fisherman’s meal” consist of a filet of fried sole with rice sautéed with shredded sole, caramelized onions, toasted almonds, and tanoreen spices. It came with a tomato & cucumber salad on the side. I tried a piece of the fish and it was nicely fried, not greasy at all. A seemed to enjoy it but she has quite the small appetite so she had a lot leftover. I will definitely be back to try their falafels (fried ground chickpea balls) and knafeh (a sweet cheese pastry soaked in rose syrup). 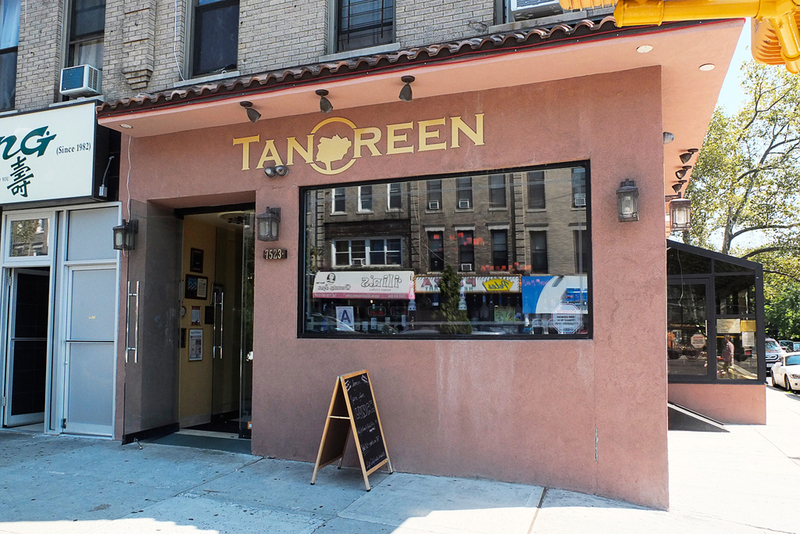 Now that I’ve finally dined here, I understand the hype and Tanoreen is definitely going to go on my neighborhood rotation of places to go when I eat out. I would also like to mention that the service here was great. They were attentive but not intrusive; our water glasses were never empty, they brought over this flatbread with spices that just came out of the oven for us to try, and were generally just very pleasant. Have you guys ever tried Middle Eastern food? What are your favorite dishes? Please let me know in the comments. ooh thanks for letting me know! i have never seen vermicelli like that. but it was great. might start cooking my own rice like that. god i love pita bread this definitely sounds like the restaurant for me and it sounds so filling too! I can’t believe all the food they serve you in those pics and eggplant done 2 ways that’s awesome! I’d definitely be a huge pig at this restaurant i wish it was near me lol. I think next time I go, I will get two or three appetizers instead of an entree so I can try more things. omg I used to go here when I lived in Brooklyn and LOVED this place! it’s such a great place! i’m kicking myself for not going earlier.